Ernesto Valverde's men arrived in Valencia early on Thursday, after a short flight from Barcelona. The Barça squad have a big game against Valencia at Mestalla (9:30pm CET) in the second leg of their semifinal in the Copa del Rey. They hold an advantage after winning 1-0 in the first leg at the Camp Nou, and are targetting a fifth consecutive final in Spain's top domestic cup competition. The travelling party flew from Barcelona's El Prat airport at 10:45am, landing 45 minutes later in Valencia. 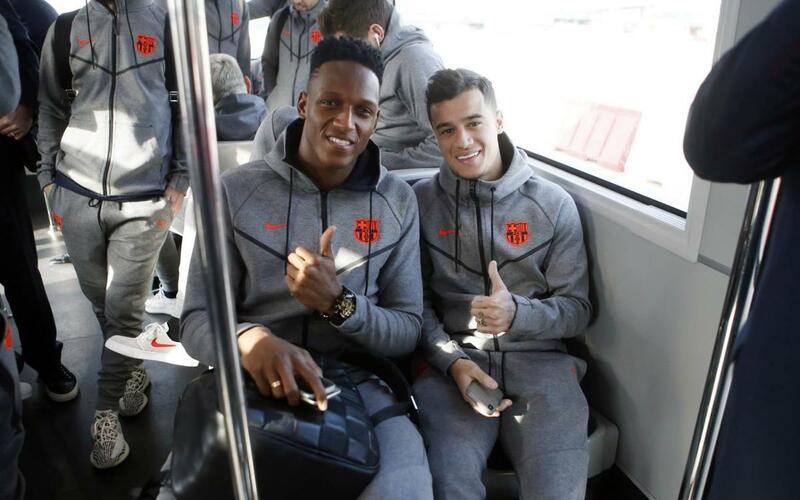 Players Philippe Coutinho and Yerry Mina travelled with the squad for the first time, and are two of the 18 players named on the list for tonight's game. Accompanying the players and staff were Directors Oriol Tomàs and Xavier Vilajoana, and Head of Institutional and External Relations, Guillermo Amor.